Though some may view it as violent, martial arts are an integral part of many cultures around the world. While some were created for warfare, such as Indonesia’s Pencak Silat, others, like China’s Kung Fu, were created to be an extension of one’s morals and principles. After centuries of evolution, some aspects of martial arts have been perfected to take full advantage of all the biological levers and pulleys that our bodies are made up of. With physics and data analysis, one can easily find the mechanics of what makes punches and kicks so deadly. The roundhouse kick is one of the simplest kicks in martial arts, but it takes full advantage of our built-in body mechanics. The fundamental principles of the roundhouse kick are dependent on the concepts of torque and angular velocity – or rotational force and speed, respectively. Your intuition might tell you that in order to have a stronger kick, you’d either have to put more force into it or make the kick go faster. However, the real question lies in how that’s done. When lifting heavy things, people say that your power comes from your legs. Similarly, when kicking things, your power comes from your hips. 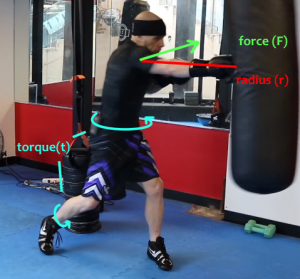 Torque is produced by how quickly and how much you rotate your hips and foot, to some extent—you can see this in the feet and hips of the fighter above. 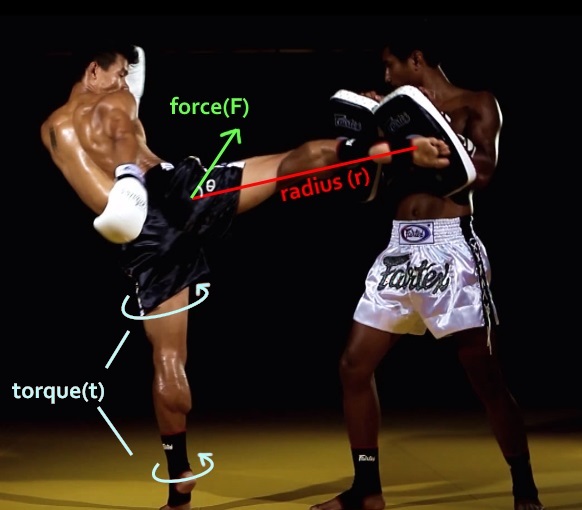 A study conducted by Colin Gavagan measured the various techniques of experts in Muay Thai, Karate and Taekwondo. He found that the average impact force of a roundhouse kick on a kicking shield from a professional Muay Thai practitioner was 1400 N! The force of this kick is roughly equivalent to a sledgehammer being swung as hard as possible at someone’s body! Through just a simple rotation of the hips and feet, one can deliver kicks strong enough to break bone. Similarly to the roundhouse kick, the straight right requires torque in order to generate enough power to do any considerable jab. Something most people may not know, however, is that most of the power from a straight right comes from the legs and hips. Rather than rely solely on the shoulder and arm muscles, a boxer uses his legs and hips to add to the power of his punch. A punch is at a distinct disadvantage from a roundhouse kick in terms of power, however: a roundhouse kick uses the entire lower leg for contact, while a punch makes contact with only one’s hand. Whereas a leg might weigh 10% of someone’s weight, a fist would reasonably make up only 1%. How does a boxer make up for this difference in weight? The answer lies in the “snap”. Δt stands for the total time it takes for the force to be applied, which in the case of a boxing glove on a punching bag or body, can’t be changed much. However, as the time of impact stays constant, if one increases the speed of their punch one can significantly increase the force of it. By focusing on the extension of the punch in your shoulder and forearm, you can significantly increase the speed your hand. The sheer speed of a punch can make up for it’s lack of mass behind it. For such seemingly simple moves, there are so many fundamental processes going on at once that it’s impossible to analyze all the nuances that comprise them! There’s a lot of science that goes into something that, at first glance, seems like a simple punch. Noah is an undergraduate student at Georgia Tech looking to change the world one step at a time. He loves to hike, stargaze and build computers and spends his spare time dancing, working out and gaming.